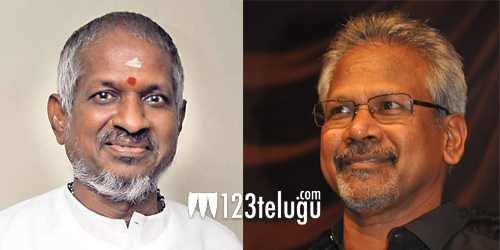 Mani Ratnam and Ilayaraja, two of the greatest legends in Indian cinema, are celebrating their birthday today. Ilayaraja has been enthralling us with his soulful music for nearly four decades now and Mani Ratnam has proved again and again why he’s one of the finest filmmakers in contemporary Indian cinema. Given their glorious legacy and achievements so far, neither of them need an introduction to anyone who is well versed with Indian cinema, especially Tamil and Telugu cinema. Both of them have become symbols of our glorious past and their works have been subject of great discussion among movie lovers. On the other hand, it’s interesting to note how the work of Mani Ratnam and Ilayaraja is being perceived by the current generation. Both of them were at their zenith in the 80s during which Mani Ratnam went on to make films like Mouna Ragam, Nayakudu and Geethanjali, while Ilayaraja composed out great songs in countless films. The duo had worked closely till early 90s and Dalapathy was the last film in their combination. From Roja onwards, Mani Ratnam has been collaborating only with A R Rahman. Interestingly, it was Roja which made Mani Ratnam a renowned filmmaker across India and since then, he has made quite a few films in Hindi. There has been a big change in the works of both these legends in the past ten years and the accolades that used to pour in instantly until the 90s, seem to be not so obvious these days. There’s no doubt that Mani Ratnam and Ilayaraja will continue to inspire countless people to walk down their path, but there’s no doubt that their fans are desperately hoping that they repeat the magic once again in near future. 123telugu.com team wishes the duo a very happy birthday.